When I decided to address the issue of dementia care in hospitals thirteen years ago, I rang my local hospital and said I wanted to speak to the person in charge of dementia care (there wasn’t one) and that I intended to change dementia care in hospitals (probably, with hindsight, a strange call for the person at the other end to deal with – especially from a German teacher!). It has often – certainly in the early years – been an uphill struggle, but I’ve met many committed and passionate people along the way and together we keep doing all we can to make dementia care the best it can be. 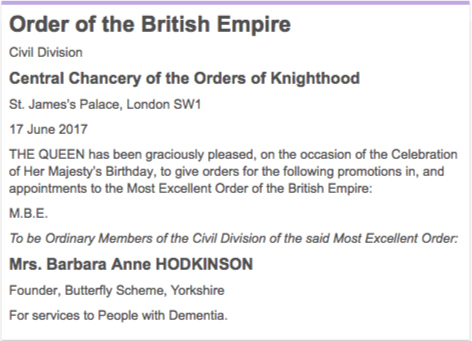 In the Queen’s Birthday Honours this month, I was awarded an M.B.E. Receiving the official letter from the Cabinet Office was a shock; I pushed the letter into a drawer for a couple of days and avoided thinking about it, then I finally took it out properly and read it. Seeing the citation – “for services to people with dementia” – I felt very emotional and so, so glad that the well-being of people with dementia was at the heart of this. My aim has always simply been to see healthcare teams enjoying delivering dementia care, so that people living with dementia – and their carers – feel better-supported. There are many people out there working passionately towards that same goal and the response to this honour from people living with dementia, carers and the whole dementia care community has been overwhelming in its extent and warmth. Thank you.